After three months of leisurely playing Text Twist Turbo on my cellphone, I finally reached a million points. Had I been playing nonstop, the time to get such score would have been shorter. Nonetheless I proclaim myself a certified Text Twist addict. 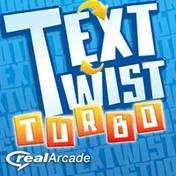 Text Twist Turbo, a mobile version of Text Twist, is a word puzzle game that displays 7 jumbled letters the player must 'twist' and form 3-to-7-letter words. Solving the seven-letter word lets player proceed to the next level. For that million-point milestone, I was expecting some kind of award or achievement recognition since there are accomplishments such as Super Fast (solving a seven letter word within five seconds) and Basic Genius (solving a total of 1000 words in Basic puzzle). But for those also wanting to hit that score, you may be disappointed; nothing is there to be had. Even way before 250,000 points you can already gain all the awards. So I had to ask myself what to do next. Well for one I still play the game when bored or to mentally tire myself to sleep. Further still, it won't hurt to try and reach a billion points.